Would you let your two-year-old chop mushrooms for making pizza? Montessori educator Sara Cotner does. “Montessori Moments: 2 years and 3 months”, Sara Cotner, Feeding the Soil, June 3, 2013. It’s one of the ways she implements Montessori methods at home. Sara and co-author Kylie D’Alton have assembled a cookbook, Kids in the Kitchen: Simple Recipes That Build Independence and Confidence the Montessori Way. Proceeds from sales of the cookbook go to support Montessori education, but I have two copies of “Kids in the Kitchen” to give away: just leave a comment about what is your favorite food to cook with your kids, or would like to cook with them. I will pick two winners on October 23. As Sara explains in an interview with her co-author, “Interview with Kids in the Kitchen co-author Sara Cotner”, Kylie D’Alton, How We Montessori, July 18, 2012, it was an adjustment for a Montessori educator trained to guide school-age children to apply those Montessori methods to a newborn. As a result, the cookbook is practical and accessible. The recipes are healthy and simple, with short ingredient lists. The book offers guidance on choosing kid-sized tools and equipment. But the most important lesson in the book is to respect your child and let them follow their interests in the kitchen, even when our mommy-alarms are beeping danger . . . danger . . . . The day after my birthday date night at the symphony (earlier post), my family came over to visit. My mom baked a chocolate sheet cake and we let my son put in the candles. I showed him how to strike a match and light some of the candles. The match burned down and started to singe his fingers; he cried out, and I helped him blow it out. No harm done, and he learned about using matches. He thought it was a little scary but sort of exciting. Taking on challenges—even knives and matches—is part of how Montessori education builds future leaders. Most Montessori schools are private, tuition-based schools, and so Montessori education is not available to many families, especially low-income and minority families. That is why Sara founded Montessori For All, public open-enrollment charter school: to offer tuition-free, dual-language Montessori education for a diverse group of students. Montessori For All’s charter application was recently approved by Education Commissioner Michael Williams, as discussed in this earlier post. Unless the State Board of Education exercises its veto, Magnolia Montessori For All will open in Austin in 2014, and Redbud Montessori For All will open in San Antonio in 2016; read more in this earlier post about the February 2013 information session. Now that she has a charter, Sara has more challenges, including spreading the word about Montessori For All, and raising the money to open the new schools. If you are interested in Redbud Montessori For All for your family, fill out the pre-enrollment form, and like them on Facebook. Support Montessori For All by making a donation or by purchasing “Kids in the Kitchen” on Amazon—proceeds from the cookbook go to support the charter school. Learn more about Montessori education at home by following Sara’s blog, Feeding the Soil, and Kylie’s blog, How We Montessori. Last but not least, please leave a comment (what’s your favorite food to cook with your kids?) to enter this giveaway, and ask your friends to enter, too. Disclosure: Sara gave me a personal copy of “Kids in the Kitchen” at the information session in February 2013; I’m keeping that one. 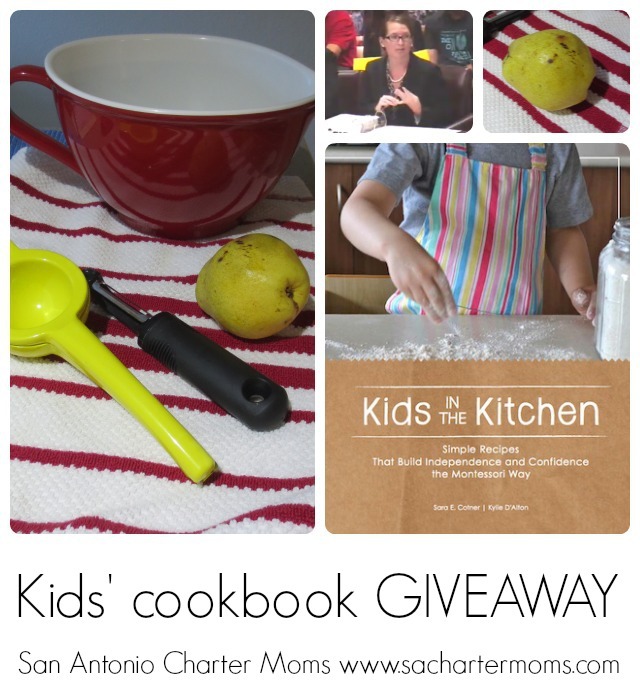 Recently, I bought the two copies of “Kids in the Kitchen” to give away to my readers. We really enjoy baking together over here, but this makes me think I can involve them more in the kitchen! I love the How We Montessori blog!! Baking: I think you would really enjoy the chocolate cake recipe in the cookbook! Wow, this book sounds great! I’m falling in love with the Montessori method (among all my other favorite educational ideals!) and I would love to include my girls more in our cooking routines. If your kiddo is a peeling pro, then you will probably like the “vegetable ribbons” recipe. The carrot & apple salad recipe also involves peeling. I love making a salad with my 4 year old. She rips up the lettuce by hand and is so proud of her role in the salad that she will eat it too. A great way to get vegetables in her and have her learning in the kitchen. I love to either make tacos with my children or breakfast foods like pancakes, gravy and biscuits! My little one’s favourite thing is cracking eggs! So scrambled eggs is his favourite.